If you decide to share your life with an African grey parrot, be prepared for lots of conversation. These birds are the best talkers of all parrots, and first-rate mimics. Bringing an African grey parrot home means a lifetime commitment, as this bird might live as long as 30 to 50 years. Two types of African grey parrots are commonly kept as pets. The Timneh has dark grey body feathering, white feathering around his eyes, a reddish beak and sports a maroon tail. 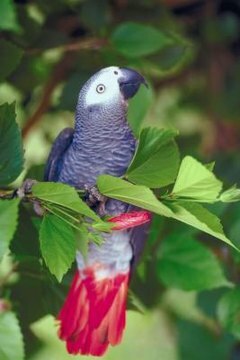 The slightly larger Congo Grey boasts silvery body feathering and a red tail, along with the white eye feathering and a black beak. Male and female African grey parrots look much the same, although males are slightly larger than females. Females usually have a smaller head and neck. If possible, keep your African grey in an aviary, where he has room to fly. If that's impractical, purchase a cage at least 10 feet high. The cage should not only include water receptacles for drinking, but shallow bowls for bathing. African greys love toys, so provide plenty of them, with appropriate rotation so the cage doesn't become too cluttered. Provide your bird with perches made from natural, pesticide-free woods, such as pine or willow. African greys love seeds, but an all-seed diet isn't adequate. They can be picky eaters, so offer them a variety of foods. These can include boiled corn, green or cooked beans, peas, carrots, wholegrain bread, pears, apples, bananas and oranges. You should always provide your bird with a commercial seed mix specifically designed for parrots, along with fresh, clean water. Avoid giving your bird grit. Parrots hull any seeds before consumption, so grit isn't necessary. Because they like it, African greys might eat too much of any grit left in the cage, which can cause intestinal impaction. Repeat after me: Don't gossip in front of this bird. African greys are terrific mimics, so be prepared to hear any of your common expressions tossed right back at you. These parrots also sing and repeat sounds -- try to choose a ringtone your bird can't copy, or you'll constantly be checking the phone. Because they're so smart, these birds need lots of stimulation, both mental and physical. Try to socialize your bird with family members and friends. It's easy for an African grey to become a one-person pet, overly protective of that individual. Because they're sensitive birds, never raise your voice to them.